Queen of Hills they call her. Up above in the clouds, in the lofty clutches of the Himalayas, lies sprawled the glorious town. It is a place where clouds are at your feet with the highest of mountain ranges by your side. We reached the Burimari-Changrabandha border just past the district of Lalmonirhat, by bus and promptly took an early morning trip amidst the glassy ponds and dark woods of Burimari, perched precariously on creaky wooden benches fixed atop rickshaw vans. Long queues at the check-post were growing longer, long before the sun reached mid-sky. A great deal of caution and reverence was in order while discretely bribing officials on both sides of the border before we could proceed. A scorching Siliguri served merely as a junction as we got hold of a Tata vehicle of our own and sped ahead towards the irresistible beckoning from seven thousand feet above, towards the allure of Darjeeling. Soon the rusty iron frames of the buses and the crowds around local tea-shops disappeared. With our ascent, evergreen Pines and Birches all around conceded a serpentine road round and round alpines hinting at the Himalayan ranges that were palpably in the offing. Rows of evergreens stood proud and majestic, ascending along the way in an attempt to reach up to the sparkling blue skies. The engine roared louder as the roads became more and more precipitous. The quiet serenity of the virgin mountains quivered ever so slightly at the strange and unfamiliar sounds of civilisation. Flocks of birds fluttered at a distance. Families of mischievous monkeys hanging deftly from the twisted coils of wiring, looked on with awe as we passed them somewhat noisily. While the roads were far from plain and smooth, the turns were treacherous and sharp. Just beyond the edges laced with robust cinderblocks was a sheer drop of over four or five thousand feet (and growing). With deft, lightning fast moves, our expert Nepalese driver Paldin maneuvered the Tata Sumo along the roads, incredibly veering past the odd speeding trucks and private cars that emerged constantly from behind the sharp bends ahead. Sometimes he stuck his head out and shouted greetings in a strange tongue and we shut our eyes forcefully, waiting for the inevitable crash that seemed to lie just ahead. After an hour or so, though racing heartbeats had subdued a little, feet and hands still ached from the imaginary brakes that we subconsciously stepped on as the dangerous turns slyly turned up ahead. From Siliguri it takes about two-and-a-half hours to reach Darjeeling. Of course, ask any local inhabitant and chances are you will never get such a simple answer. Any request for such estimation is complied by the common reply of, 'depends how you are travelling. By bus it will take three hours, by foot…' and the list continues. By the time, we had come close to the summit and passed the sleepy towns of Kurseong and Ghum, the sun had dipped dangerously down the Westward skies and icy winds were starting to blow in. Submission of the sun was very rapid and suddenly we found ourselves lost amidst the long stretches of shadows of the craggy peaks. Up above, the zenith glimmered in the dying lights before plunging into a similar gloomy fate. It was somewhere in the middle of the sudden jerks brought about by the unexpected turns and the nerves brought about by the unwanted knowledge of the sheer drops lurking greedily in the dark that Darjeeling presented itself in all its glory. Ahead in the distance, she shone like a horde of diamonds on the mountainside. In the solid darkness, lights down the mountainside shimmered and twinkled ever so slightly as if shivering in the gentle breeze that blew down from the Himalayan Heavens. In about half an hour, we had reached our destination. Once out of the car the chill in the air was unmistakable. It was more than a chill we realised soon. It was freezing! Temperature forecasts had predicted a spine-chilling zero degrees at night for that day. Upholding the demand for a 'geyser' in the shower as sacrosanct, we located the perfect hotel in Gandhi Road. It was not until the next morning when the sun had finally mustered the audacity to brave the misty morning sky, that the splendour of Darjeeling manifested itself completely. Just in front of our hotel, a narrow strip of road waved by. Across the road was a ridge over five thousand feet deep. Standing at the edge, the eyes wandered off to the few bamboo huts balanced precariously on the sheer glides of the mountain. Far below my feet, specks and stretches of clouds floated idly. A kingdom of pines strove to reign over the swarm of shrubbery that grew in the merciful shade. Farther below, all the disparity meshed into a flowing, velvety green carpet scathed by visible stretches of indecisive mountainous roads. Tea gardens chequered the west-side mountains. Just beyond the valleys, the timid sunlight played on the patchy emerald textures on the steeps. Far away in the horizon, the icy blue Himalayan range was etched along the sky. Our early morning trip to Tiger Hill, one of the best places to see the sunrise over the Himalayas, turned out to be futile as a dense fog shrouded everything around us. Scraps of cloud dampened our clothes as we succumbed to the unrelenting demands of a couple of local coffee vendors. It was common, Paldin the driver told us casually. The tyrant fog lingered all day like some deity playing gleefully with the despair of the mortals. Disappointed, we took a tour on the Toy Train, which is a slow-moving train that travels through mountainous terrain and passengers can enjoy a beautiful view of Darjeeling. As time was short, a few other destinations had to be accommodated over the next couple of days. 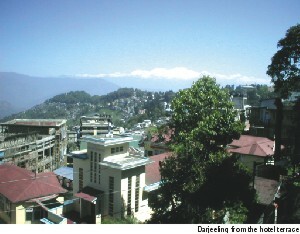 Kalimpong and Mirik are two most preferred spots amongst tourists. Other places of interest include the zoo, the ropeway, Gangamaya Park, Rock Garden and the Mountaineering Institute. 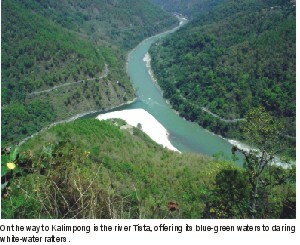 The river Tista is on the way to Kalimpong. While from an observation point some three-thousand feet above, we watched the blue-green waters, laced with a frothy white foam, cascading and threading through stubborn boulders it was decided that an opportunity for white-water rafting would be too much of an adventure to miss. Taking a slight detour, rafting was arranged. Clad in shorts and life jackets five of us boarded the raft accompanied by two guides. A ten-minute crash course preceded this adventure of a lifetime. We clung to the oars just as much as to dear life while the raft was whisked away by the roaring waters. After three hours or so, soothed and refreshed by the crash course both over and through the ice-cool waters of Tista, we realised it was too late to reach Kalimpong by daylight and so we returned to Darjeeling. Next morning, we were up as early as four and washed duly in the freezing morning water (the geyser wasn't working). We joined a convoy of cars, heading towards Tiger Hill. Reaching our destination we disembarked and stood in anticipation on the edge of a cliff. The Himalayas could be somewhat made out in the misty horizon. Between us, was an endless valley that stretched well into Nepal. Shadows, hundreds of miles long were surreptitiously creeping away from us as the sky reddened a little. Slowly the sun peeked from behind a blue-grayish range. A cluster of houses far away at the edges resembling powdery chalk on the greens was peaked out by two monstrous pinnacles, only just lending a view of what I had traveled so far to see. Kunchenjunga revered and cherished, is the third highest peak in the world. But that statistic is nowhere nearly as astounding as the real thing. It was majestic. Awesome and astonishing, the first glance at the Himalayas defies vocabulary. A magnum opus in ivory and azure, we watched Kunchenjunga relish the first kiss of the sun. Over the next one minute, the two played out an ancient ritual in the most vibrant of colours. The peak grew from ivory to a pale, rancid yellow reaching a flaming, fiery orange as frosty blue shadows frolicked just below. The halo-like stretch of clouds at the apex borrowed a little blue from the skies and blended it like a master artist, with the fires below. The play was over in a matter of minutes. Icy winds snatched the thousands of sighs that could not but escape. No one clapped out aloud. There was no visible standing ovation, only silence was to follow. Only silence.